Jewish Home chairman after PLO calls to cancel recognition of Israel: The Palestinians are not interested in peace and never have been. 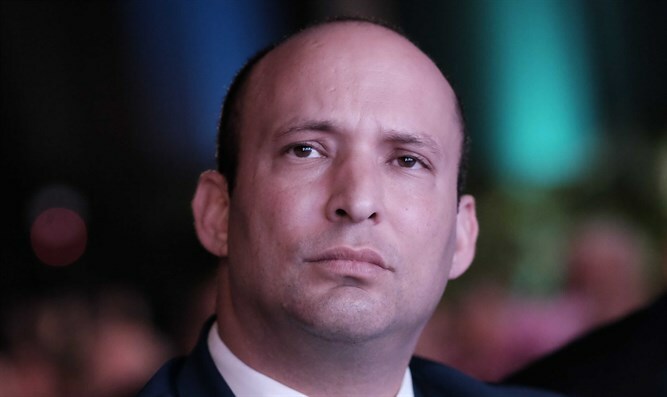 Jewish Home chairman and Education Minister Naftali Bennett responded on Monday to the Palestine Liberation Organization (PLO) Central Council’s recommendation to cancel recognition of Israel. “The Palestinians have never been serious about recognizing Israel. They have always been planning to destroy Israel piece by piece and throw the Jews out of our land,” said Bennett. “They want to cooperate with Israel, but they continue to pay the salaries of terrorists who kill Israelis,” he continued. “The charade has ended. They have shown their true colors - the Palestinians are not interested in peace and never have been,” Bennett concluded. The PLO Central Council in Ramallah earlier on Monday decided to cancel recognition of Israel until it recognized a Palestinian state on the pre-1967 borders with eastern Jerusalem as its capital. The Council, which is headed by Palestinian Authority (PA) chairman Mahmoud Abbas, stated that "this decision was made in light of Israel's continued denial of the signed agreements." It was also decided to revoke the validity of the Oslo Accords. While the PLO never upheld its pledge to remove the clauses from its national covenant which delegitimize the Jewish state and endorse an armed struggle against it, the 1993 Letters of Mutual Recognition exchanged between Prime Minister Yitzhak Rabin and PLO chief Yasser Arafat formed the basis for Israel’s acceptance of the PA establishment and operation in Judea, Samaria, and Gaza. In January, several weeks after US President Donald Trump recognized Jerusalem as Israel’s capital, the PLO called on the PA to renounce its recognition of Israel. Since Trump’s recognition of Jerusalem, PA officials have rejected US attempts to restart peace talks with Israel and have been boycotting American officials. Abbas has been trying to bypass US efforts to broker peace with Israel by pressuring other countries to recognize “Palestine”.